The Quotes list lets you see what quotes are in the system, convert them to orders, cancel them (lost quotes), reprint the quote, review the price breakdowns, etc. Clicking on the "Prices" for the quote will allow you to alter the quoted prices (for example you give the customer a special deal). Clicking on the "Print" for the quote will reprint the quote. Clicking on the quote number will either convert the quote to an order, or allow you to mark the quote as "lost". Edit: Click on the Edit button to make any changes and turn into an order. Lost Quote: Click on the Lost Quote button to cancel the quote. 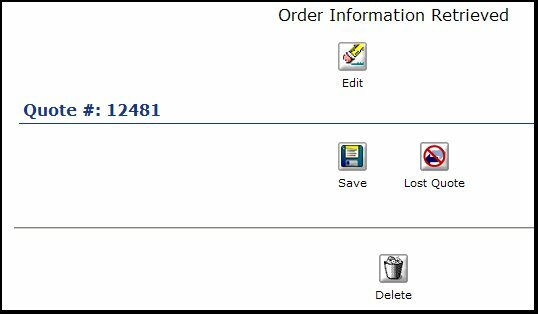 Save: Click on the Save button to create an order without changes to the quote. Delete: Click on the delete button if you want to cancel the quote without counting it as a lost quote for statistical purposes.